Cryptocurrencies are struggling to recover from the most recent drop. The G-20 Summit, including Trump, discussed taxing digital coins. The charts show that a different potential for each crypto. World leaders including US President Trump, Chinese President Xi, German Chancellor Merkel, Japanese PM Abe, French President Macon, Russia's Putin, and many others descended on Buenos Aires over the weekend to talk about global matters. One of the topics in the agenda-packed summit was cryptocurrencies. According to Japanese news source jiji.com, the leaders want to create an international system which will tax cross-border payments. The goal to catch cases of tax avoidance. It then specifically mentions the use of cryptocurrencies in money laundering. The participating countries are working on a proposal to be discussed in the next gathering in Japan before a final version is due in 2020. While there is enough time, the idea that all the world's major countries want to tax crypto transactions does not help digital coins, to say the least. And they weren't in such a great state anyway. Cryptos have not suffered another deadly fall, but seem unable to recover. After Bitcoin recovered around 30% from the bottom at $3,456, it began sliding once again. Ripple and Ethereum followed soon. After almost every stage of consolidating, another downturn came, so the omens are not favorable. Bitcoin is trading in a narrowing range since it hit the rock-bottom level of $3,456. The consequent recover to $4,400 set clear borders for the triangle, or wedge. According to textbooks, the price should explode after this narrowing. But to what direction. The Relative Strength Index on the four-hour chart is somewhat lower, but not a disaster. At the time of writing, the price is hugging the 50 Simple Moving Average. Before $4,400, there is some resistance at $4,051 which was the initial low after the granddaddy of coins lost $5,000. Further resistance above $4,400 awaits at $4,600, the recovery line in mid-November. On the downside, we find $3,825 which initially capped Bitcoin on its recovery attempt. It is followed by $3,675 that provided some support on the way down. It's then down to $3,456 and finally $3,000. All in all, the current recovery pattern looks like a "dead cat bounce." Similar to Bitcoin, Ripple is trading in a narrowing wedge, but uptrend support is more significant here. 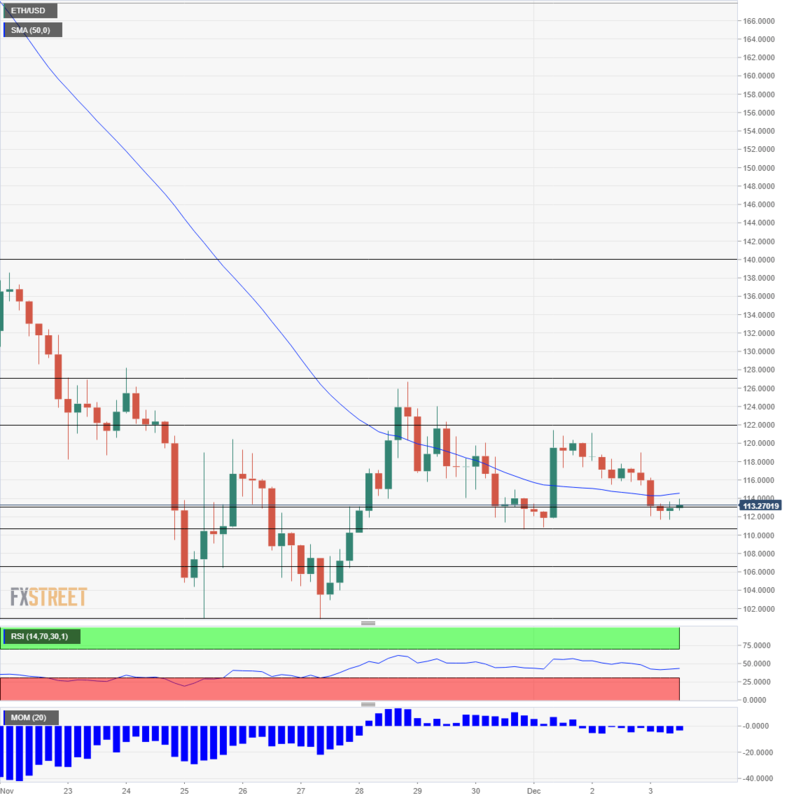 We see that XRP/USD has its RSI closer to 50, far from oversold conditions. It trades below the 50 SMA, a bearish sign. Support awaits at $0.3550 which supported the pair in late November and early December, making it a critical double bottom. Further down, we see another double bottom at $0.3420. It provided support during two days in late November. Lower, $0.3245 is the next level to watch after it served as the low point earlier in November. On the topside we, not $0.3730 that served as support and then as resistance. It is followed by $0.3810 that capped Ripple in early December. 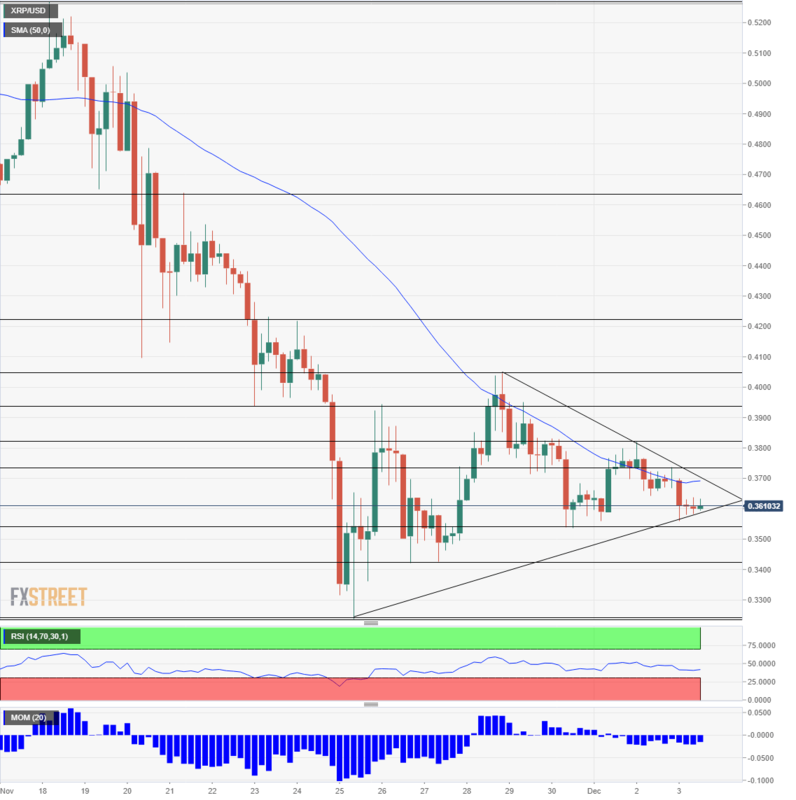 $0.3940 held XRP/USD down when it attempted to break back above $0.40. The next line is $0.4050 that was the high point of the recovery and the beginning of the downtrend just as November was about to end. 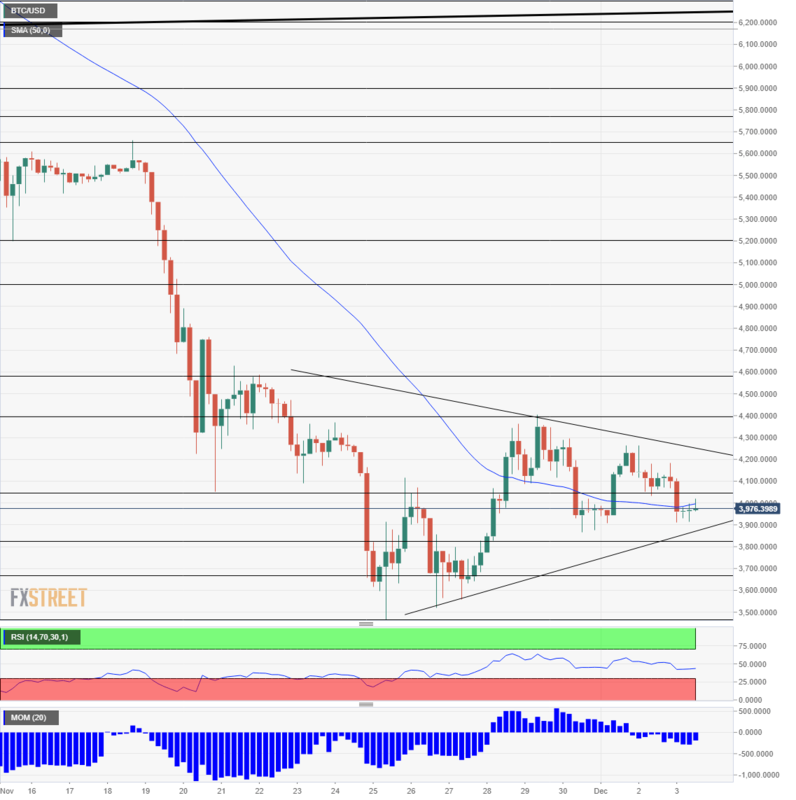 Ethereum is also trading under the 50 SMA, but Momentum is not significant to the downside. This is an improvement after ETH/USD suffered last weekend. $110 provided support to the pair in late November, and the price got close to it in early December. Lower, $106.20 was a swing low in late November. $101 was a low point twice in late November and defends the round $100 level. Looking up, significant resistance is only at $122 which held Ether down in early December. $127 was the high point of a recovery attempt in late November. It is the only top coin that does suffer from a clear "dead cat bounce" pattern.